South African author, born, bred, and now based in the Free State. Author of several biographical books. Also a highly experienced journalist. In recent times he has become famous for the QOOPANE LITERARY GALLERY of which he is the Curator. During the 2010 World Cup finals hosted in South Africa, many tourists from a number of countries frequented the Qoopane Literary Gallery which boasts profiles of hundreds of writers around the world. 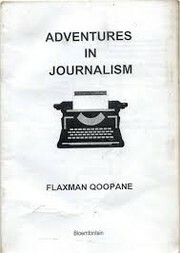 Are you sure you want to remove Flaxman Qoopane from your list?